Thanks to the Add Printer Wizard, installing a printer with Windows Vista has never been easier. Any printer made in the last five years will be a Plug and Play device, which means that Vista either already contains the drivers for your printer or can load them automatically. If for some reason your printer is not Plug and Play, you can still use the Add Printer Wizard to automate the process. The first step is to read the instructions that came with the printer. Depending on the instructions, there are three possible ways to proceed. Once you’ve determined whether you need to load drivers first, you can turn on your computer and follow the installation option that fits your needs. If your printer is a Plug and Play device, your job is nearly done. Just connect it and wait. Windows Vista will install what it needs automatically. Although most printers can be immediately connected to your computer, some printers require that you install software before you connect them. If your printer requires software to be loaded before the printer is plugged in, insert the disc that came with the device and follow the onscreen instructions. Choose Start→Control Panel→Printer (under the Hardware and Sound category); in the window that appears, click Add a Printer. In the Add Printer Wizard, click the Add a Local Printer option. In the resulting wizard dialog box, select the specific port for Windows Vista to use for the printer. Click Next. If you know that you need to use a specific port, click the down arrow on the Use an Existing Port Field and select the necessary port. If you aren’t sure, just use the recommended port setting that Windows selects for you. 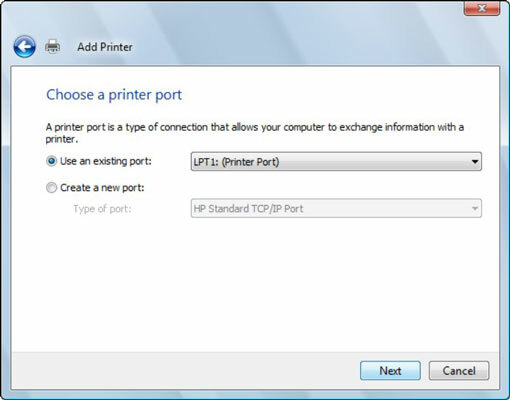 The Select a Printer Port dialog box. In the next wizard window, shown below, choose your printer’s manufacturer and then choose a printer. Then click Next. 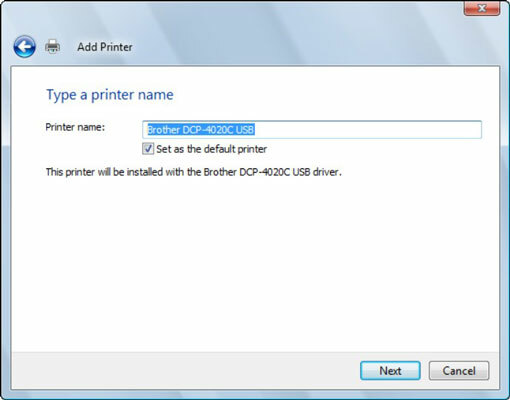 The Install the Printer Driver dialog box. If you have the manufacturer’s disc, insert it in the appropriate CD drive now and click the Have Disk button. 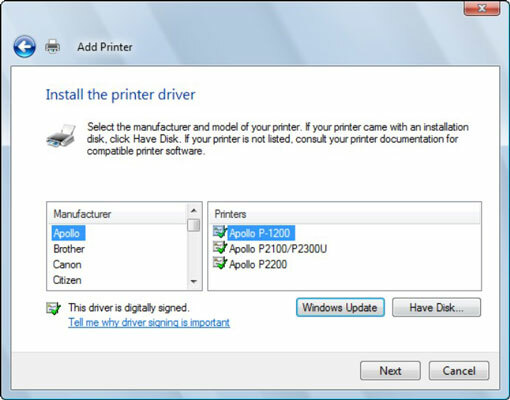 If you don’t have the manufacturer’s disc, click the Windows Update button to see a list of printer drivers that you can download from Microsoft’s Web site. In the resulting Type a Printer Name dialog box, enter a printer name. Click Next. If you don’t want this to be your default printer, clear the Make This My Default Printer option. The Type a Printer Name dialog box. 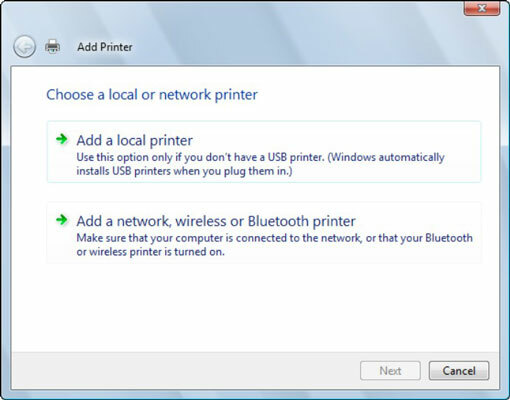 If your computer is on a network, you get an additional dialog box in the wizard right after you name the printer. Select the Do Not Share This Printer option to stop others from using the printer, or you can select the Share Name option and enter a printer name to share the printer on your network. This means that others can see and print to this printer.